Street food is a feature of Vietnamese people in general, and Hanoi in particular. It is really normal to see the locals easily enjoying food when sitting on the sidewalk of the streets. If you once come to Hanoi, you should try this eating culture like a local one. A lot of amazing food you can find around the old quarter. 1. 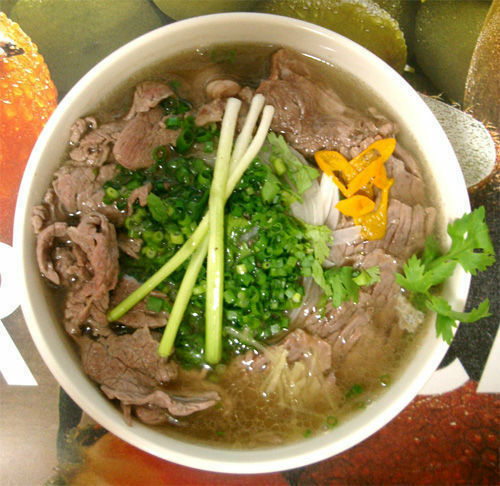 Noodle or “Pho”: The typical dish of Vietnam, very popular. The ingredients include: broth, noodles made from rice, a few herbs, and meat (normally the chicken or beef). The famous heirloom Pho kiosks in Hanoi: Pho Thin at 12; Pho Bat Dan at 49 Bat Dan Street; Pho Ly Quoc Su at 10 Ly Quoc Su Street, or Pho Suong at Dinh Liet Street. 2. La Vong Fried fish (Cháº£ cá Lã Vá»ng): Slide fishis marinated, grilled over charcoal then pan fried in fat located at 14 Cha Ca Street. 3. Pancakes: literally "sizzling cake" is named for the loud sizzling sound it makes when the rice batter is poured into the hot skillet. Savory fried pancakes made of rice flour, water, turmeric powder, stuffed with slivers of fatty pork, shrimp, diced green onion, and bean sprouts. For the address you can find the good one at 22 Hang Bo Streetor 23 Bat Su Street. 5. Bánh gá»‘i (or samosa): is a fried or baked pastry with a savory filling, such as spiced carrot, Kohlrabi, onions, peas, eggs, vermicelli, meet (beef or pork). The size, shape and consistency may vary, but typically, they are distinctly triangular. The good kiosk is located at 52 Ly Quoc Su Street. 6. Bún Ä‘áº­u: a simple, rustic cuisine in northern Vietnam Thisdish is usually served as a snack. Key Ingredients include fresh noodles, fried tofu, mix lemon shrimp sauce, served with peppers and herbs such as shiso, marjoram, basil, lettuce…The address for good kiosk is located at 39A Ly Quoc Su Street or Dong Thai Street. 7. Bánh cuá»‘n: Bánh cuá»‘n is a rice noodle roll made from a thin, wide sheet of steamed fermented rice batter filled with seasoned ground pork, minced wood ear mushroom, and minced shallots. Sides for this dish usually consist of cháº£ lá»¥a (Vietnamese pork sausage), sliced cucumber, and bean sprouts, with the dipping sauce called nÆ°á»›c cháº¥m. You can go to 72 Hang Buom streetor 101 Ba trieu street to enjoy banh cuá»‘n as these are the good one. 8. Bún cháº£: The dish of grilled pork & noodle, Bun cha is served with grilled fatty pork (cháº£) over a plate of white rice noodle (bún) and herbs with a side dish of dipping sauce. The good kiosks are located at no 1 Hang Manh Street or also you can go to Gia Ngu Streetaround old quarter area. These foods are normally cheap in price. You may have a meal with the price of $1 to $2 per person. Don’t be surprises: the food is delicious and the price is cheap, that why I said. Foods in Hanoi are amazing.